Dr. Eric Hoskin, Ontario’s Health Minister, speaks about his top four priorities at HealthAchieve November 5. Ontario’s health minister has what he calls Health Plan version 2.0. 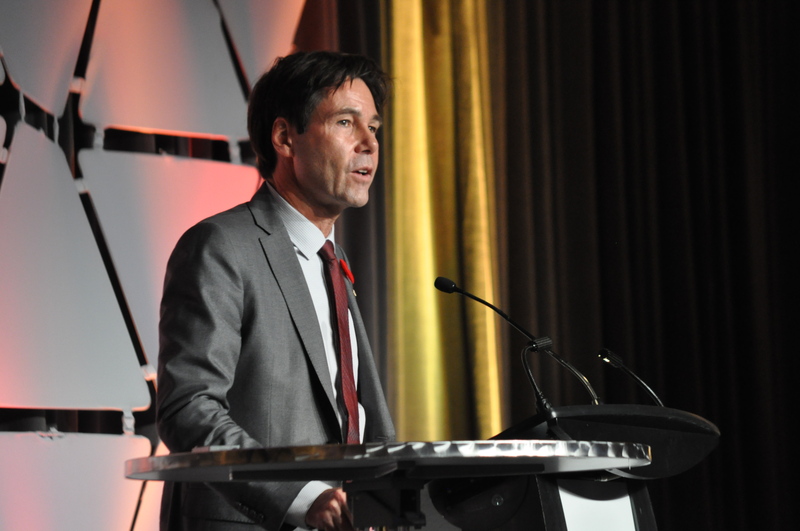 Speaking at the closing of the Ontario Hospital Association’s annual HealthAchieve conference, Dr. Eric Hoskins revealed his top four priorities after less than five months on the job. Few would disagree with them given they fit well within the modern paradigms of health system redesign, but getting there may be a different story. It’s not surprising that a redesign of home and community care is the first priority. News from the Champlain CCAC must be vexing the new Minister as patients in need of long term home support are being dropped from care and the bar has been set exceptionally high for new patients to access service. Sadly, CCAC staff have been told to direct patients to paid out-of-pocket forms of care or to social service agencies with long waits, raising the question whether the government is letting the principles of Medicare slip away under Hoskin’s watch? The present home care system has also been accused of being very top heavy, with too little cash finding its way to front line services. Each agency employed by the CCAC requires not only its own administration, but requires ongoing oversight and contract management given the incentive to cut corners to maintain profits. Hoskins has appointed Gail Donner, the former Executive Director of the Registered Nurses Association of Ontario, to table recommendations for reform early in the new year. It is the second recent assignment for Donner who serviced as chair of the Long-Term Care Task Force on Resident Care and Safety action plan in 2012. The second priority is to move towards integrated coordinated patient-centered care, a topic that transcended just about every session at this year’s HealthAchieve. After eight years of integration mantra, it’s clear Ontario has less than a seamless system of care – a point many speakers made over the course of the three-day conference. Whether its accessing home care after discharge from hospital, or making the transition from youth to adult mental health services, the province is dropping the ball. Hoskins told the audience that in the future quality improvement plans would be required to include patient engagement in the process. “We are moving away from a time when we provide care for patients to a time when we provide care with them,” he said. The third priority is a focus on health promotion and wellness, calling on Associate Minister Dipika Damerla (MPP – Mississauga East-Cooksville) to take a more active role. The fourth priority is transparency – an issue that will likely be more challenging than Hoskins thinks given the deep culture of secrecy within the Ministry. OPSEU, for example, has been trying to access a government-commissioned Deloitte report on Medical Laboratories since the spring through a Freedom of Information request. Even though the report is presently generating discussion about significant changes to laboratory services, at best we have only been promised a redacted version. Commercial labs have told us that they have long had the full report. 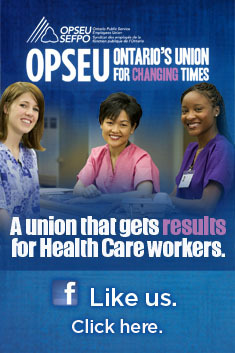 OPSEU is the dominant representative of medical laboratory technologists in the province. During the session on mental health, assistant deputy minister Nancy Kennedy let the cat out of the bag that the government was looking into the use of Social Impact Bonds (SIBs) for mental health, a form of monetization that will make services much more expensive and handcuff care providers to large private corporate investors. Kennedy told the audience that the Minister is “very interested” in this form of privatization – not an entire surprise given Hoskins promoted SIBs while in the role of Minister of Economic Development, Trade and Employment. The basic idea of a SIB is that a service provider seeks private financing to establish a public program. If that program succeeds in reaching its agreed-upon goals, the investor receives a very generous rate of return. If it fails, they lose their investment. Steffen Kramer, a senior consultant with Stratos, recently pointed out in SocialFinance.ca that there a mismatch between private investors who have strong incentives for low-risk returns and the goal of SIBs to foster innovative new programs. Innovation by its very nature entails greater risk. Transaction costs of establishing contracts to manage these schemes can also be very high and defeat any goals related to cost-savings. Given these programs cannot take place without private investors, it also raises questions about who gets to decide how government funds are spent and which programs are worthy? More on this year’s HealthAchieve and SIBs to come. This entry was posted in Uncategorized and tagged Dr. Eric Hoskins, Social Impact Bonds, Steffen Kramer. Bookmark the permalink.